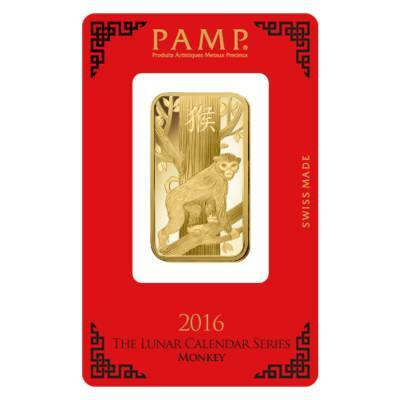 The monkey has long been revered as an animal of great intelligence and wit, these limited edition PAMP Suisse Gold Ingots feature the inventive monkey in celebration of 2016 as the Year of the Monkey. 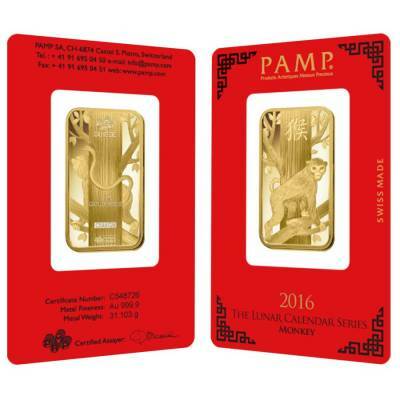 The exquisite detail of this bar is an illustration of why PAMP has earned a world-renowned name for excellent, quality products. Each bar contains 1 oz of 999.9 fine gold and is eligible for use in Precious Metal IRA accounts. The Chinese New Year of the Monkey begins on February 8, 2016, following 12 months of the stately previous year of the Goat. 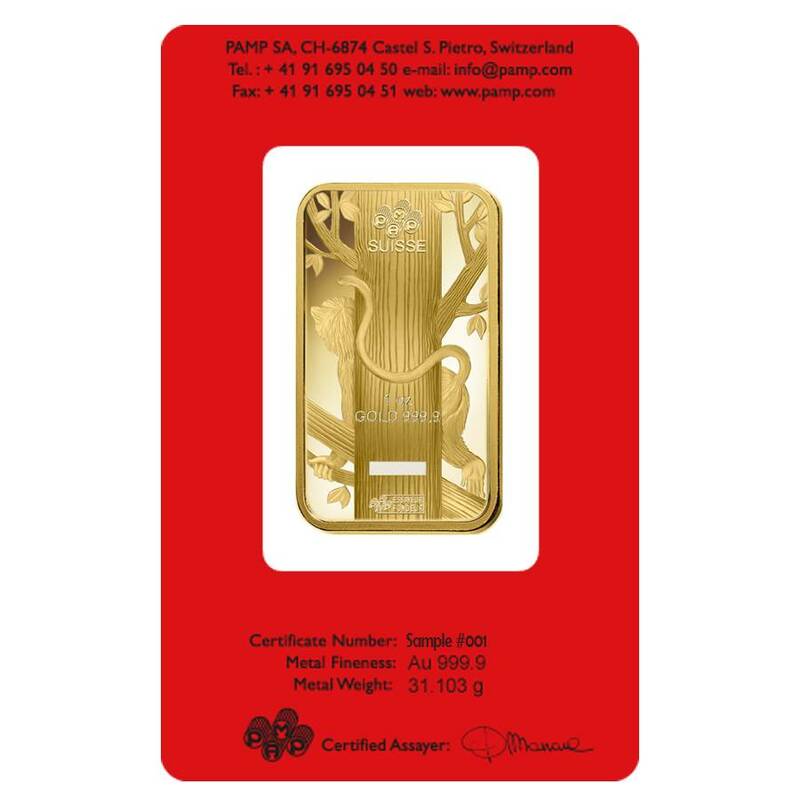 The Chinese Zodiac is an old systematic plan that relates every year to a creature and its rumored properties, based on a 12- year numerical cycle. This cheeky animal bursts with exuberance, bringing a lightning fast pace and fantastical motivation. The ingot’s remarkable and striking design exemplifies the monkey’s attributes featuring a front facing monkey moving swiftly up a tree on the obverse side. 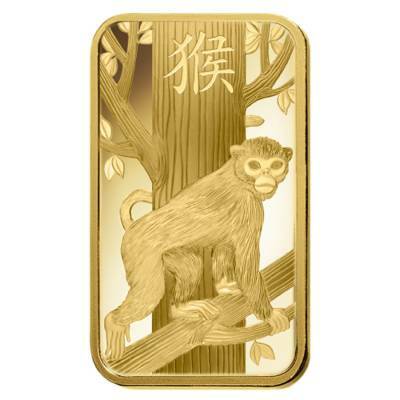 The reverse side depicts the back view of the monkey climbing up the tree. As with all editions of the PAMP Suisse Lunar Calendar Series, the 2016 Year of the Monkey ingot is sealed in a brilliant red CertiPAMP assay, ready-made for gift-giving while also appealing to the experienced bullion enthusiast. Fast shipping, nice products! Easy transaction, thanks! "Prices are competitive, you can order any quantity, and free shipping! Great company!" 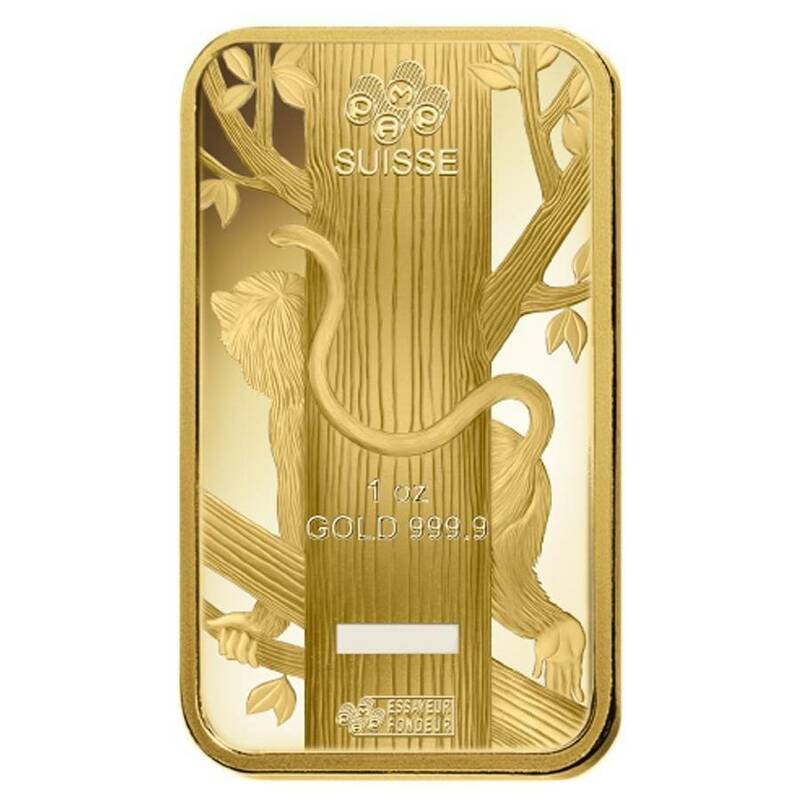 With this purchase, you earn 1324 Bullionaire Bucks 1324 BB = $1.32. We currently have 5 of this item in stock. For every $1 spend, you will earn 1 Bullionaire Buck which is equivalent to $0.001 off a future purchase. 1324 BB = $1.32.